This article is about the type of bread. For the article on the separation tithe of challah, see Dough offering. For the Mishnaic tractate, see Challah (tractate). Challah ( /xɑːˈlɑː/, /ˈhɑːlə/ or /ˈkɑːlə/; Hebrew: חַלָּה‎ Halla [χa'la]), plural: challot /xɒloʊt/ or challos /xɒləs/) is a special bread in Jewish cuisine, usually braided and typically eaten on ceremonial occasions such as Sabbath and major Jewish holidays (other than Passover). Ritually-acceptable challah is made of dough from which a small portion has been set aside as an offering. The word is Biblical in origin. Similar braided breads – such as kalach, kalács, kolach, or colac – are found in Eastern Europe, though it is not clear whether these influenced or were influenced by the traditional Ashkenazic challah. The term challah originally refers to the mitzvah of separating a portion of the dough before braiding. This portion of dough is set aside as a tithe for the Kohen. In Hebrew, this commandment is called hafrashat challah, or "separating challah". This obligation (sometimes called "taking challah") applies to any loaf of bread, not only to the Sabbath bread. The word challah is also used to refer to a specific type of bread loaf. The word challah likely comes from the Hebrew root halal. The etymology of this root is uncertain. It may originally have indicated roundness ("circle") and then also came to denote hollowness ("space"), or vice versa. It also connotes "let go" of something, to put space between things, (as the dough is taken from the family bread dough, and "let go" to the priests. It is also now known as cholla bread. The bread was adopted by bakers in Poland and Russian Empire and is known as chałka (diminutive of chała) in Poland and khala (хала) in Belarus, Russia and Ukraine. Yiddish communities in different regions of Europe called the bread khale, berkhes or barches, bukhte, dacher, kitke, koylatch or koilitsh, or shtritsl. Some of these names are still in use today, such as kitke in South Africa. The term koylatch is cognate with the names of similar braided breads which are consumed on special occasions by other cultures outside of the Jewish tradition in a number of European cuisines. These are the Russian and Ukrainian kalach, the Serbian kolač, the Hungarian kalács, and the Romanian colac. These names originated from Proto-Slavic kolo meaning "circle", or "wheel", and refer to the circular form of the loaf. Most traditional Ashkenazi challah recipes use numerous eggs, fine white flour, water, sugar, yeast, and salt, but "water challah" made without eggs and having a texture not unlike French baguettes also exists. Modern recipes may replace white flour with whole wheat, oat, or spelt flour or sugar with honey or molasses. Among Sephardic Jews, water challah is preferred for ritual purposes, because Sephardic minhag does not require the dough offering to be separated if the dough contains eggs or sugar. While breads very similar to Ashkenazi egg challah are found in Sephardic cuisine, they are typically not referred to as challah but considered variants of regional breads like çörek, eaten by Jews and non-Jews alike. Egg challah sometimes also contains raisins and/or saffron. 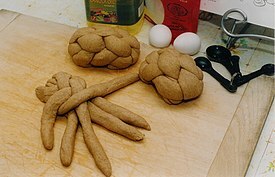 After the first rising, the dough is rolled into rope-shaped pieces which are braided, though local (hands in Lithuania, fish or hands in Tunisia) and seasonal (round, sometimes with a bird's head in the center) varieties also exist. Poppy or sesame (Ashkenazi) and anise or sesame (Sephardic) seeds may be added to the dough or sprinkled on top. Both egg and water challah are usually brushed with an egg wash before baking to add a golden sheen. Challah is usually parve (containing neither dairy nor meat—important in the laws of Kashrut), unlike brioche and other enriched European breads, which contain butter or milk. Israeli challah contains eggs or olive oil in the dough as well as water, sugar, yeast, salt, honey and raisins. It is topped with sesame. According to Jewish tradition, the three Sabbath meals (Friday night, Saturday lunch, and Saturday late afternoon) and two holiday meals (one at night and lunch the following day) each begin with two complete loaves of bread. This "double loaf" (in Hebrew: lechem mishneh) commemorates the manna that fell from the heavens when the Israelites wandered in the desert after the Exodus. The manna did not fall on Sabbath or holidays; instead, a double portion would fall the day before the holiday or sabbath. In some customs, each loaf is woven with six strands of dough. Together, the loaves have twelve strands, alluding to the twelve loaves of the showbread offering in the Temple. Other numbers of strands commonly used are three, five and seven. Occasionally twelve are used, referred to as a "Twelve Tribes" challah. The challah is covered. It is customary to use a dedicated cloth called a challah cover for this purpose, although any improvised cover is acceptable. Kiddush is recited over a cup of wine. The challah cover is removed. A knick is made in the bread with a cutting knife. The two loaves are held up together. The head of the household recites the blessing over bread: "Baruch atah Adonai, eloheinu melech ha'olam, hamotzi lechem (Le Khemekh) min ha'aretz" (Translation: "Blessed are you LORD our God, King of the Universe, who brings forth bread from the earth"). The bread is sliced (or torn, depending on minhag) and salted, and the pieces are distributed to each person at the meal to eat. The specific practice varies. Some dip the bread into salt before the blessing on bread. Others say the blessing, cut or tear the challah into pieces, and only then dip the pieces in salt, or sprinkle them with salt, before they are eaten. Normally, the custom is not to talk between washing hands and eating bread. However, according to some, if salt was not placed on the table, it is permitted to ask for someone to bring salt, before the blessing on bread is recited. Salting challah is considered a critical component of the meal. The customs of dipping in salt, sprinkling salt or merely having it on the table are based on a specific Biblical command. Tradition suggests that a meal without salt cannot be considered a meal. As Soferim 15:8 suggests, as the world could not do without salt, neither could it do without Torah. The challah bread, blessed and eaten on the Sabbath, is a part of this obligation; especially considering the challah was the priest’s portion of the bread during the Temple period. In the Torah, salt symbolizes the eternal covenant with God. As a preservative, the mineral never spoils or decays, signifying the immortality of this bond. Moreover, adding taste to food, salt represents a covenant with God that has meaning and flavor. The Torah requires that Temple sacrifices to God, sometimes described as the "food of God," be offered with salt. Leviticus 2:13 states "with all thy sacrifices, thou shalt offer salt." While this verse seems to relate to meal-offerings only; rabbis later concluded that just as no sacrifices can be offered without the presence of priests, no sacrifices can be offered without salt. Salt has always played an indispensable role in Jewish life and ritual dating back to the biblical period of ancient Israel. With high quantities located in the Dead Sea region of the historical land of the Jewish people, salt was considered the most essential and common of all elements. Salt was considered the most important necessity of life. Following the destruction of the Second Temple by the Romans in 70 CE, Jewish ritual was redefined to exist in a diaspora. Rabbinic literature suggested that a table set for a meal symbolizes the Temple altar; therefore, the blessing over food should only be recited with salt present on the table. Should one eat a meal without performing a commandment, the covenant of salt protects him. A Yiddish proverb declares that "no Jewish table should be without salt," which is in accordance with the homily that makes one's table "an altar before the Lord." (cf. Avot 3:4). The world is one part wilderness, one part settled land, and one part sea. Said the sea to G-d: "Master of the Universe! The Torah will be given in the wilderness; the Holy Temple will be built on settled land; and what about me?" Said G-d: "The people of Israel will offer your salt upon the Altar." Rabbi Zalman Schachter-Shalomi interpreted this story as such: "The wine is like the wilderness — fermentation requires wild, airborne yeast. The bread is like the settled land — bread is created through cultivation and human intervention. Salt is like the ocean — the sea, where life began and purity begins." These are the three realms of the world and are framework of what unifies the altar within the Jewish home. Thus through the Sabbath blessing over wine and Challah, the covenant with God is manifested. On Rosh Hashanah, the Jewish New Year, the challah may be rolled into a circular shape (sometimes referred to as a "turban challah"), symbolizing the cycle of the year, and is sometimes baked with raisins in the dough. Some have the custom of continuing to eat circular challah from Rosh Hashana through the holiday of Sukkot. Sometimes the top is brushed with honey to symbolize the "sweet new year." According to some traditions, challah eaten on Rosh Hashana is not dipped in or sprinkled with salt but instead is dipped in or sprinkled with honey. As above, some continue to use honey instead of salt through the Sukkot holiday. For the Shabbat Mevarchim preceding Rosh Chodesh Iyar—i.e., first Shabbat after the end of the Jewish holiday of Passover—there is a custom of baking shlissel challah ("key challah") as a segula (propitious sign) for parnassa (livelihood). Some make an impression of a key on top of the challah before baking, some place a key-shaped piece of dough on top of the challah before baking, and some bake an actual key inside the challah. The earliest written source for this custom is the sefer Ohev Yisrael by Rabbi Avraham Yehoshua Heshel, the Apter Rav, written in the 1800s. He calls schlissel challah "an ancient custom," and offers several kabbalistic interpretations. He writes that after spending forty years in the desert, the Israelites continued to eat the manna until they brought the Omer offering on the second day of Passover. From that day on, they no longer ate manna, but food that had grown in the Land of Israel. Since they now had to start worrying about their sustenance rather than having it handed to them each morning, the key on the challah is a form of prayer to God to open up the gates of livelihood. 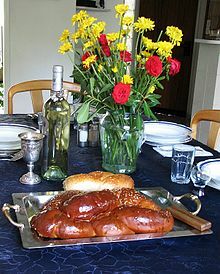 Shabbat challah, known as a bilkele or bulkele or bilkel or bulkel (plural: bilkelekh; Yiddish: בילקעלע‎) baigiel (Polish) is a bread roll made with eggs, similar to a challah bun. It is often used as the bread for Shabbat or holiday meals. Similar braided, egg-enriched breads are made in other traditions: the Armenian, the Bulgarian kozunak, the Romanian cozonac, the Czech vánočka, the Slovak vianočka, the Greek tsoureki, the Polish chałka, the Finnish pulla and the Turkish çörek. Zopf is a similar bread from Germany, Austria and Switzerland. Wikimedia Commons has media related to Challah. ^ a b Come ’Round. Forward.com, 2004. ^ Bender, Arnold E. Dictionary of Nutrition and Food Technology (4th ed.). London: Newnes-Butterworths. p. 54. ISBN 0 408 001437. ^ "Loaves For Jewish Festivals "Not Bread"". The Times (55124). London. 4 July 1961. p. 8. ^ Леонид Беловинский (2015). "Хала". Энциклопедический словарь истории советской повседневной жизни (in Russian). Новое Литературное Обозрение. ISBN 978-5444803783. ^ Barbara Rolek. Polish Egg-Twist Bread Chalka Recipe. The Spruce, 2017. ^ a b South African Challah?. Forward.com, 2005. The etymology of kittke is given as Kitt + -ke: Kitt in German means "putty" ; "-ke" is the Slavic diminutive suffix found in many Yiddish words and names. Kitke referred not to the whole challah but simply to the braids or decorations that were attached to the challah like putty before baking, and the word must have originally referred to these. ^ Колач (in Russian). Max Vasmer. Russisches etymologisches Wörterbuch. Winter, Heidelberg 1953–1958 (in German). Russian translation by Oleg Trubachyov: Этимологический словарь русского языка. Progress, Moscow, 1964–1973. ^ a b c d "Salt". Jewish Encyclopedia. Retrieved 7 March 2013. ^ Isserles, in Shulcḥan 'Aruch, l.c. ^ Shulchan Aruch, Oraḥ Ḥayyim 167:5; Jacob Zausmer, "Bet Ya'aḳob," No. 168; comp. Berachot 40a. ^ "Hallah". Jewish Encyclopedia. Retrieved 7 March 2013. ^ a b c Silberberg, Naftali. "Why is the Challah dipped in Salt". Chabad.org. Retrieved 7 March 2013. ^ Rabinowitz, Louis Isaac. "Salt". Encyclopedia Judaica. ^ a b Rabinowitz, Louis Isaac. "Salt". Encyclopedia Judaica. Retrieved 7 March 2013. ^ a b "Second Thoughts: The Key to Parnassah." Hamodia, Feature Section, p. C3. 2009-04-23.